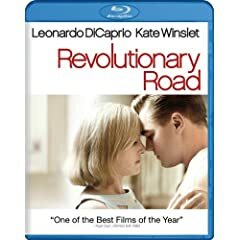 Revolutionary Road’s existential dread of unspoken feelings bubbling to the surface perhaps better resembles Tennessee Williams, a towering explorer of authenticity and self-delusion. 119 min. Paramount Pictures, Paramount Vantage. Director: Sam Mendes. Cast: Leonardo DiCaprio, Kate Winslet, Kathy Bates, David Harbour, Michael Shannon. It's a chestnut of literary study that "Drama is change," and that's true as far as it goes: at minimum an epiphany is a change. But a case can be made that drama is at least as concerned with the struggle for authenticity from those around us and ultimately, inevitably within ourselves. This basic human conflict was at the core of Greek epics and dramas, and it has certainly been enthusiastically adopted by modern American authors. In a first-world country of plenty, a vast majority lives in superficial comfort and the paralyzing fear of taking a misstep that will make it all go away. In Revolutionary Road, adapted from Richard Yates' 1961 novel about the depths to which suburban ennui can sink, Frank Wheeler tells his dictaphone, "Knowing what you've got, knowing what you need, knowing what you can do without—that's 'inventory control.'" He's rewarded for this corporate babble with a promotion he doesn't want, but because he so lacks the self-knowledge he preaches, he clings fearfully to the strong right angles of vertical America. Director Sam Mendes has himself been accused of being intellectually sterile and emotionally deadening, but his filmmaking is never less than elegant, and he has a keen sense of impactful theatrical gesture. He made his name in theater, then scored an Oscar for his filmmaking debut, another portrait of toxic suburbia. Like American Beauty, Revolutionary Road dissects a marriage of two people who are in their craven selfishness perfectly matched but doomed to destroy each other through emotional warfare. Though Revolutionary Road is beautifully shot by Roger Deakins, there’s a pleasingly theatrical quality to the enterprise, with Frank and April going at it like a junior George and Martha from Who’s Afraid of Virginia Woolf. 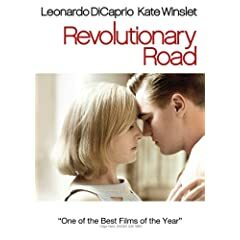 Mostly eschewing that play’s absurdist gestures, Revolutionary Road’s existential dread of unspoken feelings bubbling to the surface perhaps better resembles Tennessee Williams, a towering explorer of authenticity and self-delusion (in fact, Williams contributed a blurb to Yates' book calling it "immediately, intensely and brilliantly alive"). In classical theatrical tradition, Yates and his adapter Justin Haythe impose a truth-telling fool to madden the protagonists and inject a bit of crazed humor to otherwise dour proceedings. The mentally disturbed son of neighbor and committed suburbanite Mrs. Givings (Kathy Bates), John Givings sizes up the Wheelers as more confused and deluded than himself. For April has hatched an escape plan, a reinvigorating last chance for Frank to fulfill his promise and reclaim his manhood: they'll move to Paris, where April will support Frank while he at last takes the time to "find himself" and decide what he wants to do with his life. "People are alive there—not like here," Frank says of Paris. "I want to feel things, really feel them." At first, Givings (Michael Shannon, making a typically strong impression) shows the couple respectful awe ("Plenty of people are onto the emptiness, but it takes real guts to see the hopelessness"), but when self-imposed complications establish once and for all the Wheelers' inability to change, Givings returns to twist the knife. Even more unsettlingly, it's the fate the Wheelers deserve, for the condescension they've projected onto their suburban peers. The meat of Revolutionary Road is in its epic fights. With the Wheelers' two tots pointedly pushed off screen for most of the running time (and forgotten by the self-absorbed parents), Frank and April are left to prowl around each other in that "sweet little house" and jab each other where it hurts, with increasing brutality. April alternately praises and impugns Frank's manhood, which, she reasons, could be her salvation if he would only employ it; Frank blames April for cutting him down because of what he sees not as cowardice but self-protective realism, ostensibly in the name of love for her and the kids. It's a raw view of rudder-less marriage at a time when divorce was social poison. "Who made these rules anyway?" April asks. "How long does it go on?" Though there's an artifical patina to her '50s housewife, even in private, Winslet is resonant as ever, particularly in depicting her lonely days at home, slipping back into memories of how she got there. DiCaprio does some of his most muscular work; it's clear his Departed co-star Jack Nicholson has rubbed off on him in his projection of frustration and the mannerisms of his sarcastic attacks. Revolutionary Road is, of course, one of those Oscar pedigree movies that hordes Hollywood's finest craftspeople. They don't come better than Deakins, who early on makes the ceiling of the high-school corridor seem uncomfortably low over the estranged Wheelers and later delicately frames Winslet inside a small pane of glass overlooking a manicured lawn. Thomas Newman contributes the appropriately unsettling musical theme, which seems also to encircle the Wheelers. Production design (Kristi Zea) and costume design (Albert Wolsky) are likewise top-notch, conjuring the '50s milieu currently enjoying a resurgence on the small screen's Mad Men. Though Mendes sacrifices various nuances of the novel (and tips the balance of sympathy in favor of April), Revolutionary Road is more intellectually satisfying than either his American Beauty or his wife's Little Children. There are big ideas ("No one forgets the truth, Frank. They just get better at lying"), but there's also subtlety enough: when Frank says his last words to April in the film, "So long" sounds so sadly like a prison sentence. Roger Deakins' gorgeous, lush photography gets its full due in the Blu-ray edition of Revolutionary Road. Blacks are deep, colors spot-on, and detail and dimensionality outstanding; other than subtle edge enhancement, the image is free of digital artifacting. The Dolby TrueHD 5.1 soundtrack is unimpeachable. Though not an especially dynamic soundscape, it tells the story in aural terms very well, in a mix that's up to the task of recreating the theatrical experience. The bonus features kick off with an erudite and passionate commentary with director Sam Mendes and screenwriter Justin Haythe. The first of two outstanding featurettes, "Lives of Quiet Desperation: The Making of Revolutionary Road" (29:03, HD) covers the bases of the film's development and lensing with Mendes, Leonardo DiCaprio, Kate Winslet, Michael Shannon, producer John Hart, Haythe, producer Bobby Cohen, production designer Kristi Zea, Kathy Bates, property master Thomas Allen, costume designer Albert Wolsky, and Zoe Kazan. "Richard Yates: The Wages of Truth" (26:04, HD) is an unusual and distinctly welcome piece painting a portrait of the original novel's author. Interviewees include Yates biographer Blake Bailey; friends Wendy Sears Grassi, Joseph Mohbat, Dan Wakefield, Grace Schulman, DeWitt Henry; and daughters Gina Yates, Monica Yates Shapiro, and Sharon Yates Levine. Fifteen "Deleted Scenes" (25:14, HD) come with optional commentary by Mendes and Haythe, and the film's "Theatrical Trailer" (2:14, HD) is on hand. All site content © 2000-2019 Peter Canavese. Page generated at 04/20/2019 07:57:34PM.